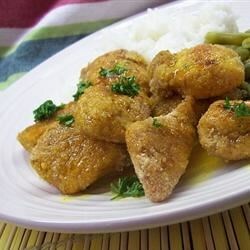 "This a great recipe that my family loves. It's fairly quick and easy, and you more than likely don't have to go out and buy any new ingredients!" In a bowl, stir together paprika, salt, and pepper. Sprinkle seasoning over chicken pieces. Dip pieces in egg, then dredge in bread crumbs. Arrange chicken pieces in a single layer in an aluminum foil-lined 15x10-inch jelly roll pan. Bake in preheated oven for 15 minutes, turning once. In a small saucepan over medium-low heat, stir together sugar, lemon juice, and curry powder, stirring until sugar dissolves, about 5 minutes. Drizzle lemon sauce over chicken, return to oven, and bake 5 minutes more. See how to make lemony chicken served with a savory mushroom sauce.